2019 marks Compliance Poster Company’s 30th anniversary! We know that some of our valued business partners have decades of experience under their belts while others are just starting up. No matter how long you’ve been around, we think that we all have something to learn and teach from each other. We’re honored to have been operating long enough to share 30 of the lessons we’ve learned from our 30 years in the compliance business, graciously contributed by members of the CPC family who have been with us the longest. 1. Stay open to change! CPC has succeeded for 30 years because of our ability to adapt to a changing world and the evolving needs of our business partners. 2. The journey of a thousand miles starts with a single step. We began by creating labor law posters for our local community, and now we serve all 50 states, U.S. Territories including Guam and the Virgin Islands, and Canada! 3. With the fast pace of legislation, today our business partners need information as much as they need posters. We’ve responded by making our website an information resource for employers, with a daily labor law news blog and a growing knowledge base. 4. No technology or process can replace trust earned over time. Our most valuable resource is the relationships we’ve formed with our business partners. 5. No matter how prestigious your role, there’s no such thing as a job that’s “below” you. A real leader serves as an example by doing whatever needs to be done. 6. Do it right the first time. It takes more time to fix a mistake than it does to implement the checks and double-checks that ensure your success. 7. Every one of your colleagues can teach you something valuable, whether that means sharing their expertise, providing an outside perspective, or serving as an example for the interpersonal skills that help a team run smoothly. 8. Above all else, focus on love. The best thing you will ever produce is your love for the work you do and the people you work with. To read the full 30 lessons, check out our 30th anniversary blog post! 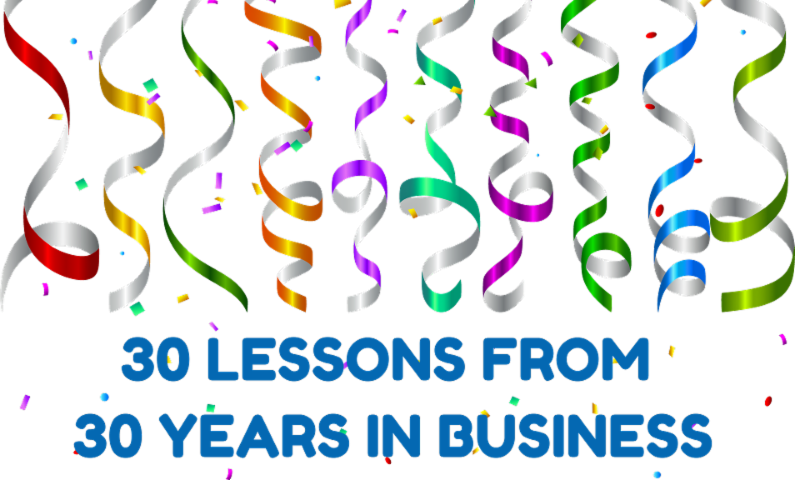 Please feel free to share with us some of the lessons you’ve learned from your years in business, a memory of a time CPC put these lessons into practice while serving you – or let us know about an area of our operations where we still have lessons to learn. The greatest gift we could receive for this monumental anniversary is your input on how we’ve grown through the years and how you’d like to see us develop in the years to come.